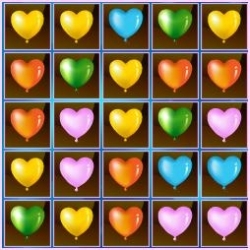 Description Valentine Heart Balloons is a simple, challenging and addicting puzzle game based on block collapse game play. You can click on a group of similar items to get them collected. There are 12 challenging levels in this game. Each level is based on different challenge and you can win the level by chasing the same. There are many mysterious powerups, which can be activated by clicking on it or clicking on the group which includes it.